Benba Motors is an independently owned and managed company. Whom have been in business for over 27 years. Benba Motor’s managing director, Dale Kushner is personally involved with the day to day running of the company. 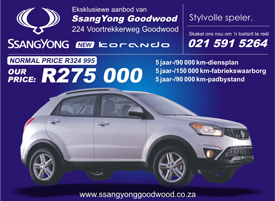 Benba Motors, conveniently situated in the heart of the "motor city" in Goodwood. Workshop facility specializing in Mahindra, SsangYong, Proton and Geely. Our phones are always answered by people not computers. We have a stable staff compliment. We adopt a long term approach to all our dealings. We nurture our customer relationships. We do not offer credit or frills which allows us to give the best price upfront. We pride ourselves in approaching all business in a morally and ethically manner. To offer our client good service at a fair price -a good deal.